A record setting day at Webster Lake also proved to be the biggest challenge of the season. 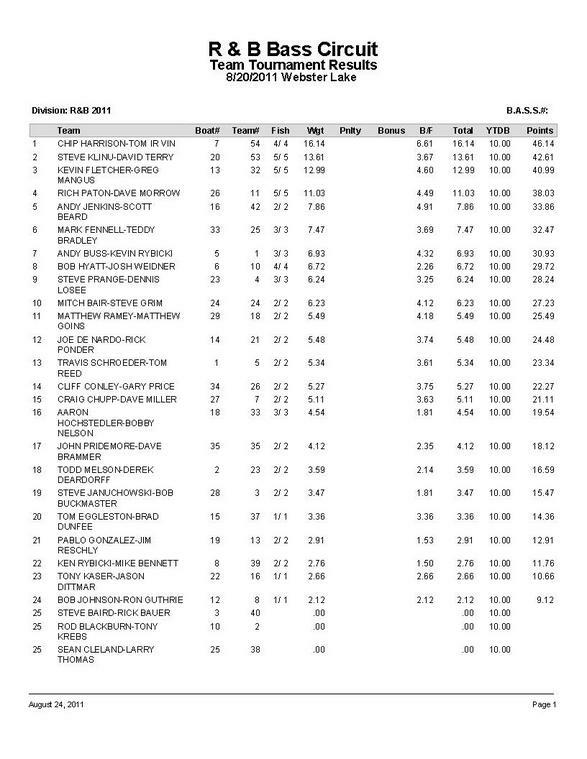 Despite seeing the biggest fish and stringer in R & B history, only 3 of 35 teams weighed limits. Yet 7 fish eclipsed the 4 pound barrier, but the majority of teams weighed just 2 or 3 fish and only 2 teams weighed 4 fish. Going into the finale, the Standings shifted little, except it now appears to be a two-way race to become the 2011 Points Champions. Bradley and Fennell lead Mangus and Fletcher by 12 points, but the season ends at one of Fletcher's favorite bodies of water, Palmer Lake. Palmer has also been an especially tough bite this season. Can Bradley and Fennell lead wire to wire? 1st Place: Professional angler Chip Harrison teamed up with Tom Irvin to break two records held by Joe DeNardo and Rick Ponder since the first ever R & B tournament at Winona Lake. Harrison and Irvin broke the Heaviest Stringer record with 4 fish weighing 16.14 pounds that included the biggest Starboard Choice Marine big bass in history; a 6.61 pound monster. 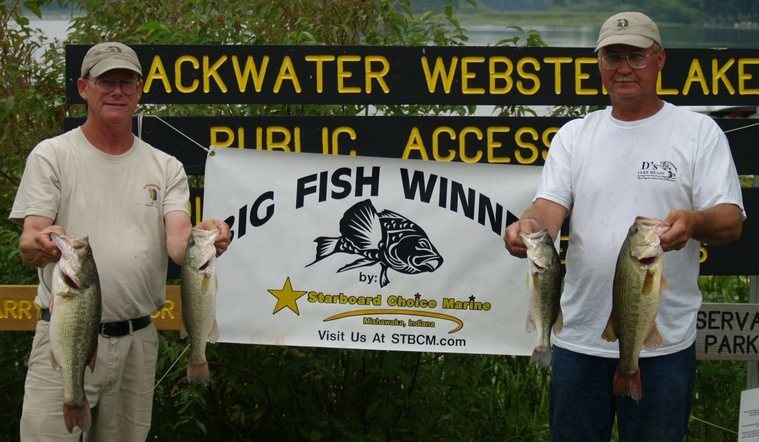 The win earned them $660 and the big fish earned them another $350 bringing their total winnings to $1010. 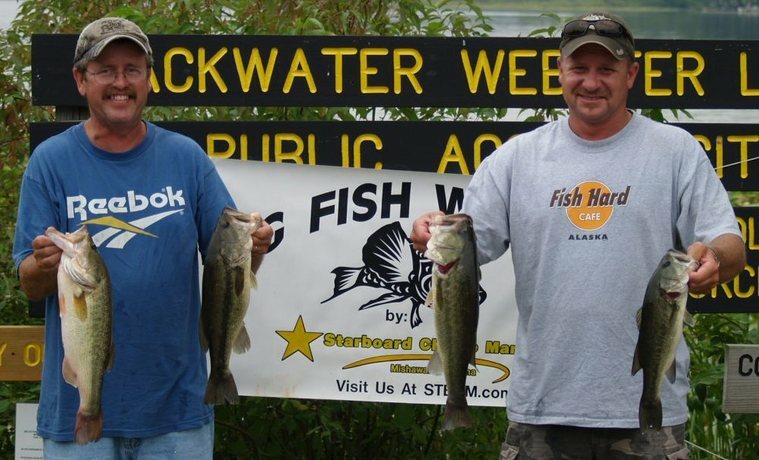 2nd Place: Newcomers Steve Kline and David Terry weighed 1 of just 3 limits for a total weight of 13.61 pounds. 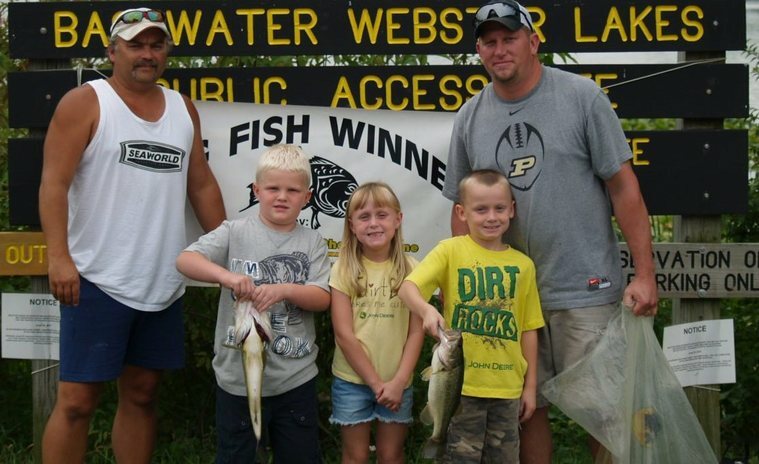 The team, who admittedly fishes Webster "a lot," used a trio of baits to bag their limit and win $404. 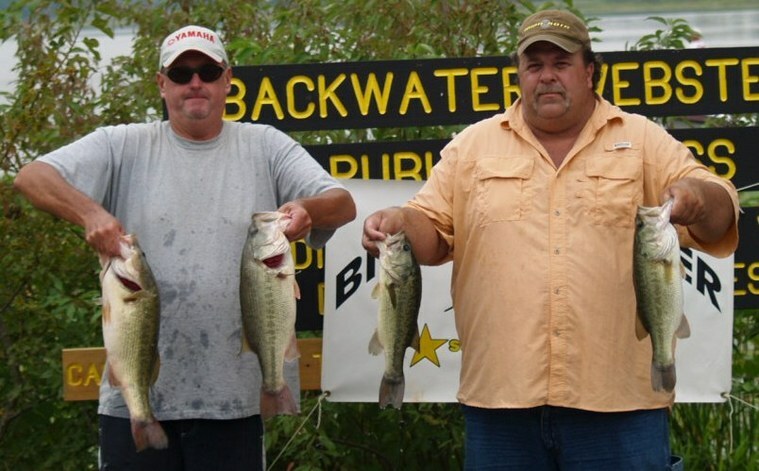 3rd Place: Greg Mangus and Kevin Fletcher put themselves in position again to take aim at the 2011 Points Champions award with a limit that weighed 12.99 pounds. In the process they won $260. According to Fletcher, "The steepest breaks were the key. With the weeds gone the way they were, these breaks seemed to be what held the fish." The team caught 6 keepers. The winners targeted docks from the outset, but their weapon of choice was unique - a 22 C Flash crankbait. Harrison elaborates, "We were targeting clusters of docks that were closest to the steepest breaks on the lake. These docks also held weeds." The combination of weeds, docks, and deep water was the right recipe. Harrison had found these areas in July when he boated two 6 pound fish on the same docks. Their 3 biggest fish came in the first hour. The big fish came in an unorthodox manner. Harrison recalls, "A [pleasure] boat was loaded up by a family and as they left I tossed [crankbait] right where that boat was sitting. The water still had ripples from the boat. It bit immediately." The crankbait bite died shortly after 8am for the team and the bite then got tough. They had planned on the dock bite to develop throughout the day, but it never materialized. Harrison felt the overcast skies prevented this from happening. Still they landed their smallest keeper from a dock. but it "Just wasn't happening." But their fortune changed at 1pm. Terry admits, "The best bite we found was at 1 o'clock with the scum frog." The team caught several fish that helped them considerably. They caught 7 keepers total. The day started off with an exciting disappointment. On Mangus' third cast he hooked into a big fish and immediately exclaimed, "Oh, big fish!" And he was right, but it wasn't a bass. It was a 40+ inch musky. Once he realized what it was, he called off the net and amazed Fletcher on how he handled the fish. Fletcher recalls, "He worked the fish up to the boat and then just snapped his rod. His jig came right off! It was done in one fluid movement as if he had practiced it." Their bass also fell to a black/blue Mango jig. They caught 5 of their keepers with the jig and got their other keeper with a C Flash crankbait. Their keepers came between 8-10 feet of water, but they caught "shorts" all day long with both the jig and crankbait in all depths. 4th Place: Rich Paton and Dave Morrow logged their second top 5 finish of the season with a limit weighing 11.03 pounds. The team caught more keepers than any other team in the field with 10. In fact, the team had a limit after the first hour! But they still had an unusual obstacle to overcome. Morrow recalls, "On the first keeper of the day, our net broke in half right where the handle meets the net. This created some stressful times through the day, but we never lost a fish that would have helped us." That exemplifies a lot of skill when considering the bait they were tossing. They spent the early part of the day in the Backwaters tossing a lipless Kinami crankbait. Morrow admits, "Its a cheap $3 bait, but might be the best $3 I ever spent!" The bait was chrome with a black top. After filling their livewells they left the Backwaters to the mainlake in search of a kicker fish. They found it under a dock. The 4.49 pound largemouth was fooled with a jig. However, that was the only fish from the mainlake that helped their limit. The other 4 fish they weighed came from the Backwaters. Their success earned them $184. 5th Place: Despite competing in just 4 of the 5 tournaments, Andy Jenkins and Scott Beard find themselves in 11th place in the Standings and are clearly on their way to qualify for the 2011 Classic. Jenkins and Beard took home $126 for weighing just 2 fish, but they were quality fish and beat out several teams with more fish. They weighed 4.91 and 2.95 pounds respectively, bringing their total weight to 7.86 pounds. The big fish bit 30 minutes into the tournament and the other at noon. But it was the fish lost that they will remember most. 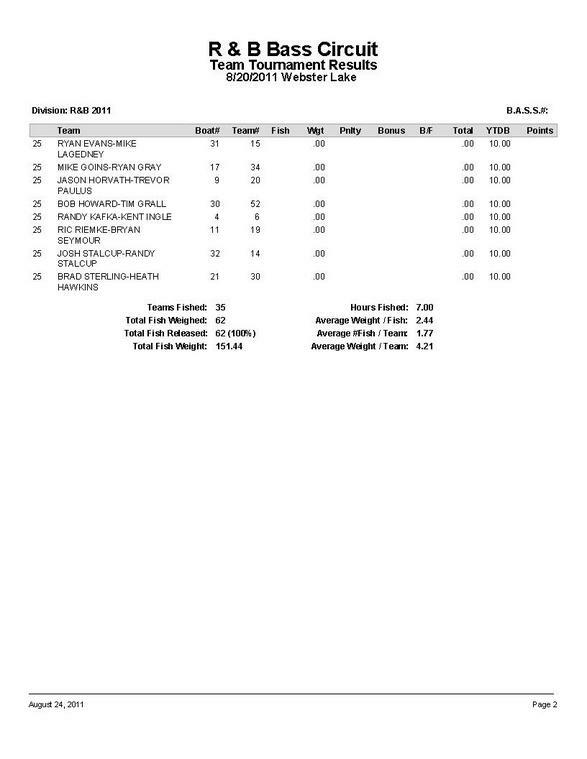 Jenkins had a fish break his 65 pound test braided line that surely would have leapfrogged them in the standings. Disappointment was extra as they felt confident they would catch a limit after a successful practice. They caught their fish on 1/2 ounce Mega jigs that were teamed up with 3 inch MD Craw jig trailers made by R & B competitor Bryan Seymour. Jenkins admits, "I was not catching anything when practicing [for Webster] until I met Bryan on the lake. He gave me a few trailers and I went on to cach a limit including a 6.5 fish." 6th Place: Standings leaders from the very beginning, Teddy Bradley and Mark Fennell weighed 3 fish for 7.47 pounds and won $110. 7th Place: Tournament Directors Andy Buss and Kevin Rybicki weighed 3 fish that weighed 6.93 pounds to earn $92. 8th Place: Bob Hyatt and Josh Weidner brought 4 fish to the scales that weighed 6.72 pounds to win the D's Lures Award.